These Gazing Balls are the top of the art quality. Created in China by pulverizing pure, natural quartz crystals and then, melting the powder down, in order to form a solid crystal ball. Led (metal) is not used in the process. Extremely clear, these Chinese Crystal Balls are gorgeous. 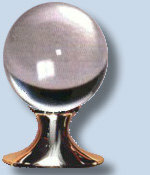 Experience the ancient fascination with Crystal Balls by owning one. 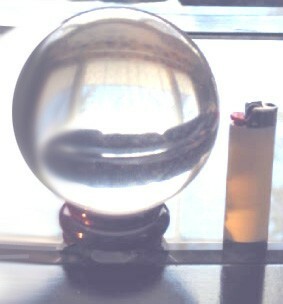 Have you ever looked into a crystal ball? 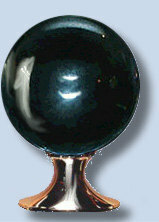 Perfect for scrying, for healing, or as unusual, mystifying piece of art. These are hand cut from solid gem rock quartz crystals created by nature millions of years ago. Favored by the wise along with the rare jet black Obsidian. It takes many weeks of crafting to produce a ball of this quality. Each one is hand polished for the finished effect. Some say that the energy can be felt when you hold it. 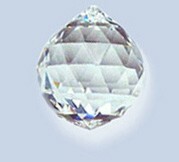 Crystal balls have fascinated humankind for ages.